Provision Healthcare is a leader in the cancer industry, pioneering oncology solutions with the ProNova SC360 Proton Therapy System. This design is the first and only superconducting compact proton therapy system and the only compact system to offer a full 360˚treatment angle on the market. Our patient-inspired engineering and design is driving new standards of excellence, improving the patient experience and the clinical treatment workflow. An uncompromising system design stands out from other compact proton therapy systems, offering all of the functionality of a full-size system plus a highly expandable treatment platform. The scalable design can be easily expanded by adding treatment rooms with little impact. The open isocenter cantilever nozzle is a distinguishing feature that improves workflow and accommodates new technology advancements. The SC360 is a smaller, lower-cost, and more energy-efficient proton therapy system providing today’s most important clinical capabilities. Introducing the ProNova SC360. The first and only superconducting compact 360˚proton therapy system. Bed-mounted dual-energy CBCT allows for 3D image at any bed position and gantry angle. ProNova’s system design leverages superconducting magnet technology in the novel compact gantry, dramatically reducing the system size, weight, and power consumption, increasing operational efficiency. Featuring an open treatment room with advanced imaging capabilities, the SC360 delivers essential clinical capabilities and remains impressively scalable. Our history of innovation establishes us as a leader in medical technology advancements. Research and development along with clinical application are integral components of our tested and proven success. The uncompromising design of the ProNova SC360 began with a focus on accuracy, efficiency, and safety. Our patented superconducting magnet technology creates a larger and more useful rectangular treatment room compared to any other system, large or small. At the same time, this technology leverages a smaller footprint, lower energy costs and overall construction costs, and optimizes operational performance. • Optional fixed surface can be used for accessories such as cameras, lasers, projectors, etc. 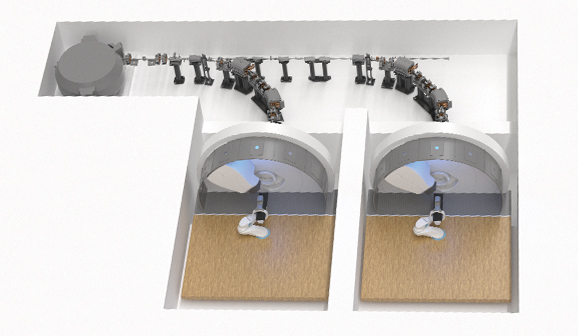 • Patented superconducting achromatic beamline enabling workflow-centric room design. *This feature is planned for future development and is not yet commercially available. Future development of features may not be available in all markets and are not guaranteed. PRONOVA SC360 PROTON THERAPY SYSTEM The SC360 is the only superconducting compact proton therapy system that maintains a full 360˚ treatment angle and fully accessible treatment isocenter, offering uncompromised performance and a distinctive open treatment room. ADVANCED IMAGING Integrated-dual energy CBCT offers increased precision and advanced IGRT with a larger field-of-view and the capability to treat multiple fields with one image. *Continuous tumor-motion tracking, and inter- and intra-beam imaging are possible with fluoroscopy mode, currently under development. FAST-SCANNING IMPT Fast-scanning IMPT beam technology allows for extremely fast layer painting and repainting, utilizing a high frequency scanning magnet up to 10 times faster than the competition. This is useful for faster treatments and less susceptibility to motion. INDEPENDENT-ENERGY SELECTION SYSTEM Another innovative and unique ProNova feature is independent energy selection for each treatment room. This provides instantaneous room-switching and greatly reduces patient treatment times, improving clinical capabilities. *Future applications include intra-fraction room switching to improve workflow and throughput. *HYPOFRACTIONATION The high-current, continuous beam cyclotron can deliver high dose rates and raster-scan beam. This can be used to deliver the same dose in fewer treatments than pulse-beam technology. SCALABLE ProNova’s system design is impressively scalable, with a unique open-room treatment area, independent energy selection, and reduced system footprint, easily accommodating the future addition of treatment rooms to meet business demands. IMAGING & WORKFLOW OPTIMIZATION Automated image registration enhances the patient experience and optimizes workflow, allowing for imaging at any bed or gantry position, rapid re-planning, and reducing patient exposure. OPEN ROOM An open treatment room improves access to the patient. Imaging independent of the gantry with large field-of-view CBCT at isocenter provides endless flexibility in workflow and the room is future-proofed to easily accommodate technological advancement. SIZE & WEIGHT Reduce size up to 52% and weight up to 83% by utilizing a lighter innovative gantry design and superconducting magnet technology. ENERGY CONSUMPTION Reduce power consumption up to 81% with superconducting magnet technology, optimizing operational expenses. LOGISTICS Smaller and lighter components allows for standard shipping with no need for oversized trucks, simplifying logistics and lowering costs. CONSTRUCTION In-house project development expertise decreases construction costs by up to 50% and reduces project complexities. INSTALLATION Our experienced team brings a streamlined installation process, expediting time-to-market. Factory-built and tested components improves quality, and reduces installation and commissioning timelines. Our patient-centered vertical integration empowers us to revolutionize comprehensive cancer care, leading future innovation that begins and ends with the patient. This unique model leverages our expertise across the spectrum of care, delivering the first and only model of its kind to deliver new standards of excellence that exceed patient expectations and operational efficiencies. The ProNova SC360 was conceived, designed, manufactured, tested, and commercialized to enhance the patient experience and treatment process, improving clinical workflows. ProNova has a distinguished history of developing advanced technology and delivering solutions to the medical device market. Founded by the leaders of CTI Molecular Imaging, these renowned entrepreneurs who first revolutionized cancer diagnostics with positron emission tomography (PET) are redefining the future of cancer treatment once again. 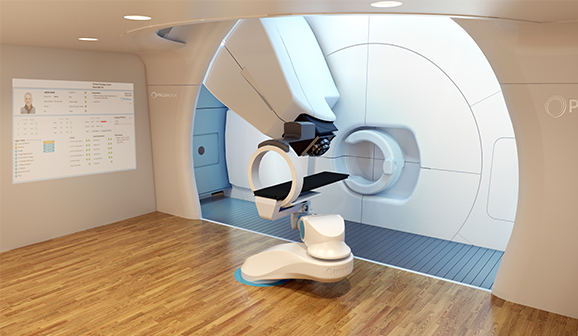 Provision Healthcare is making proton therapy a clinical reality for millions of cancer patients with the introduction of the SC360 Proton Therapy System, designed and built by the world-class ProNova technical and operations team. Trusted and proven, our expertise helped develop an industry with over 350 cyclotrons, more than 3,000 PET & PET/CT systems, and 160 PET radiopharmaceutical distribution centers installed around the world today. Today we continue to challenge the status quo and are shaping the future of cancer treatment with the ProNova SC360, the next generation of proton therapy. Join us in shaping the future of cancer treatment. ProNova colleagues are on a mission to develop the next generation of innovative cancer treatment, united by our passion to fight cancer and advance technology. Our growing team is a rewarding career opportunity to make a difference in the lives of cancer patients and their families. We are challenging the status quo in the oncology healthcare industry with innovative cancer treatment, state-of-the-art technology, best practices and patient care. We are redefining the future of cancer treatment in an environment where innovation thrives. Our vertically integrated model attracts expertise across the continuum of care, with a wide diversity of careers that touch cancer solutions for every patient. Our Culture of Care is about Respecting the Dignity and Value of Every Person, where our relentless and centralized focus on the patient experience and patient outcomes drives our passion, our mission and our significant contributions that lead the healthcare industry with new standards of excellence.